Hey, remember how we all thought the new Terminator movie was called Terminator: Genesis? 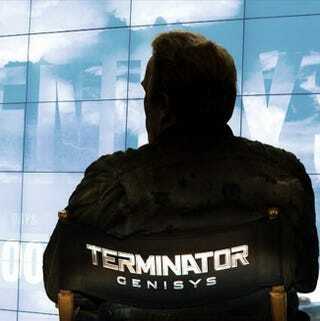 Well, star Arnold Schwarzenegger just Instagrammed a pic of his chair from the set revealing the movie's logo and the real title, Terminator Genisys. Which is a typo. That is now somehow the official title. There's absolutely nothing in the movie that can justify this horrible misspelling of "genesis." I assume there's some cyber/tech/whatever company featured in the movie that calls themselves Genisys, but that does not excuse this absurdity in the slightest, especially since there's no colon separating the two words. When you're not sure if a movie title is correct or one of my many, many typos, you know something is terribly wrong.